6 Mar 2018 Washington, D.C. The “Trumpocrats,” the group of working and middle-class Democrat voters who supported President Trump in the 2016 presidential election, have won a victory, as their nemesis in the White House, Gary Cohn has resigned. 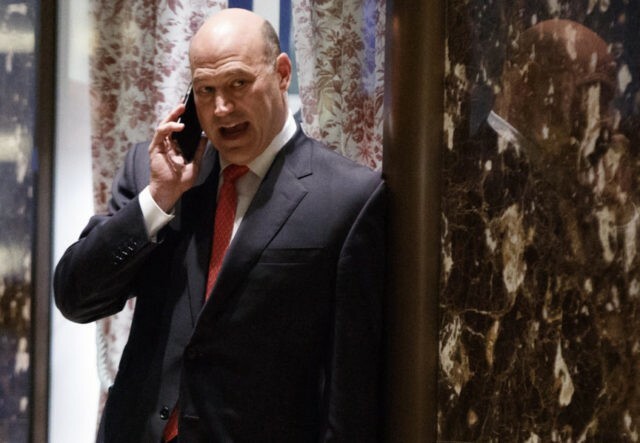 On Tuesday, White House economic adviser and the leader of the globalist pack inside the West Wing, Gary Cohn, announced he would resign from his position after failing to stop Trump’s economic nationalist agenda on trade. As Breitbart News reported, Cohn has been working against Trump’s economic nationalist agenda on trade for months now, failing to stop the president from moving forward with a 25 percent tariff on imported steel and a ten percent tariff on imported aluminum. The Trumpocrats — who helped deliver the rust belt for Trump after failing to be represented by decades of pro-free-trade Republican and Democrat administrations — are excited about the White House’s tariffs on steel and aluminum, noting how they are designed to level the playing field for American industries and protect U.S. jobs. It’s just like our borders, you don’t have secure borders, you don’t have a secure country. 10 percent on something that we’re importing 90 percent of, I mean… if I had to take 10 cents a can for every Coca-Cola I drank to rejuvenate our metal industry and our aluminum industry in America, I’d gladly do it and I think most patriotic Americans who care about our country and our jobs and our national security would gladly do it also. Breitbart News has reported extensively on the Trumpocrats and their allegiance to Trump, many of whom voted for the populist over candidate Hillary Clinton solely for his economic nationalist agenda on trade. Now, the victory for the Trumpocrats comes in the form of Cohn’s resignation at the White House, upping the influence that Trumpocrat allies and economic nationalists Commerce Secretary Wilbur Ross and Peter Navarro will have in the administration.